The Church Starter Kit is the perfect starter kit for a minister business. 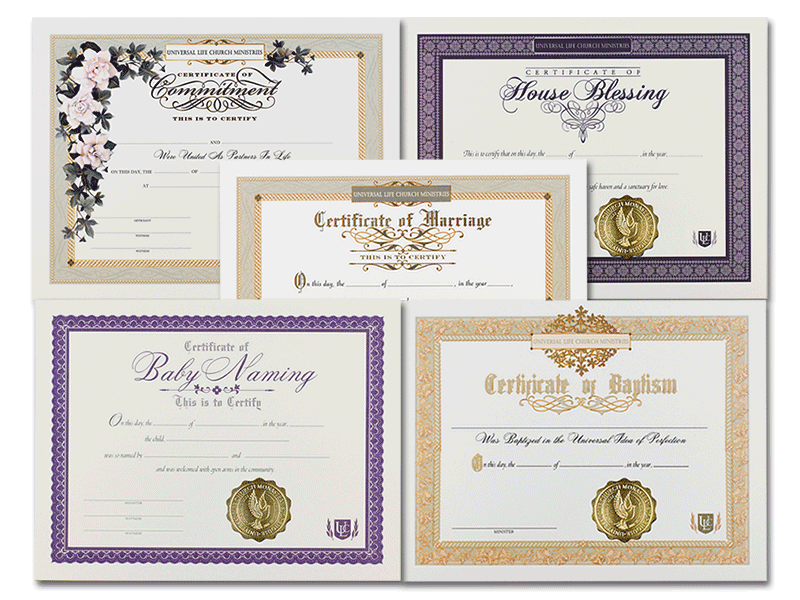 Contains a wide selection of various ceremonial certificates for each occasion. If you are getting ordained specifically to perform a wedding, please select the location of the area in which the marriage license will be filed. If you don't plan on performing a wedding in the near future, just select the location where you live. Explore the career of a professional minister with this specific package that is designed for these needs. Be a proud leader and a resource to those in your community that are in need of guidance. You will receive official legal proof of your ordainmenship that you can present to your clients, friends, family. Use the bonus materials to indicate to the public that you are an ordained minister that is on official ministerial business. You must enter your legal name only, any titles will be removed. You must verify the spelling of your name as it will appear on your legal paperwork. If performing a wedding, you could be required to purchase a Letter of Good Standing (check the Marriage Laws). Is the wedding in the 5 boroughs of New York City? You must get the New York City Package instead. Is the wedding in Nevada? You must get the Nevada Package instead.